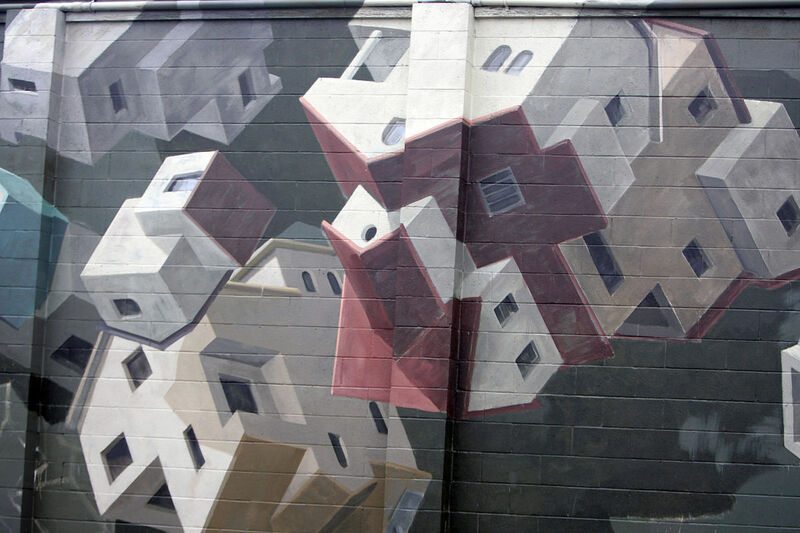 A portion of the work in progress of the mural by artist Cinta Vidal, from Barcelona, Spain. It is being painted on the back of a building at the NAPA Auto Parts. How do we feel about murals in public places? Some people hate them. They'd prefer the color beige. For the past two decades, downtown has been home to some perfectly nice murals with historical themes. This woman with the magical butterflies is part of a just-completed mural at Soscol Avenue and Vallejo Street. It is painted on the back of the building housing the Napa Valley Register and NAPA Auto Parts. The mural is the first of several planned in the Napa Valley Vine Trail's Rail Arts District. On the wall of the Starbucks at First and Main, a painting of the bustling Napa waterfront, circa 1900, with masted schooners and rows of warehouses. On the Carithers Building, opposite Dwight Murray Plaza, floating images of notable Latinos, current and historical, from near and far, as well as Our Lady of Guadalupe. At First and Franklin, a panoramic mural of Napa Valley movers and shakers, circa 1907, and the landmark buildings of their time, some of which still stand. I'm partial to the riverfront scene with the masted boats. I don't notice the others anymore. They're too educational. These historically themed murals were part of a 1990s program by Leadership Napa Valley and the Napa Chamber of Commerce to revitalize downtown. Organizers wanted historical depictions of community life. "They are not intended to be solely decorative or to pursue a special interest," according to their mission statement. This rejection of the "solely decorative" was something New England Puritans would have been comfortable with. Time moves on. Good-bye historical. Napa's new murals have been radicalized. The crop going up along the Vine Trail in the new Rail Arts District is wildly, flamboyantly decorative, with provocative psychological undertones. Looked at intensely, they may twist up your mind. I just happen to work in the Rail Arts District, aka RAD. The images impinge on my consciousness as I drive up to The Register on Vallejo Street. The most stunning of the new murals stretches for 152 feet along the back of my office building. 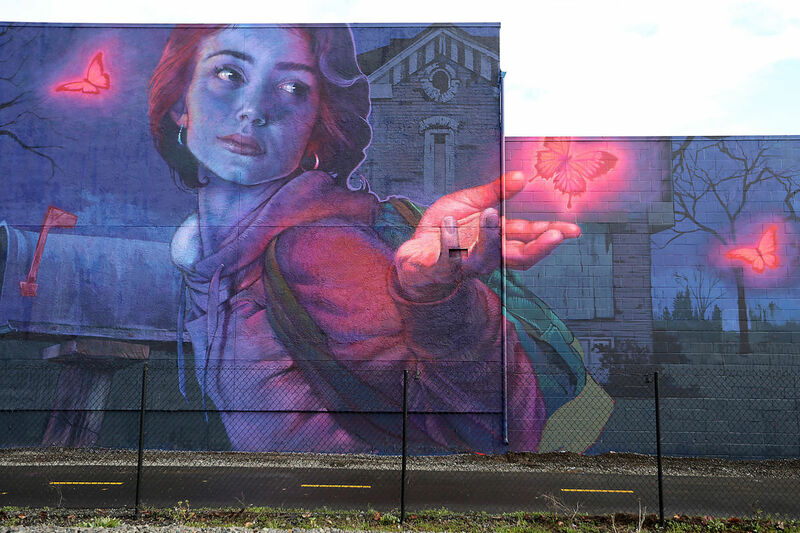 Painted by muralists from Poland, Natalia Rak and Bezt, this work, cryptically titled "Knocking on Heaven's Door," depicts a woman releasing, or perhaps catching, electric butterflies against a haunting village background. Where is this place? What exactly is going on? Is it all a dream? Across Vallejo at the rear of Matthews Mattress is "Chromadynamica," a brilliantly colored geometric work by Felipe Pantone, an Argentine-Spanish artist, that suggests a TV test pattern on the fritz. Stare for five minutes and the colors will fry your eyeballs. Just north of the Register, behind NAPA Auto Parts, is "Floating Napa," a just-completed surreal mural of houses tumbling in the air by the Spanish artist Cinta Vidal. Who among you has seen these three works of public art? I'm betting that most of you have not. They are not on the front facades of major buildings on major streets. They're on building backsides normally hidden from the civilized world. The Rail Arts District is adding distinction to a stretch of the Napa Valley Vine Trail and Napa Valley Wine Train tracks that cuts a diagonal through the normally obscure, gritty heart of the city. The Vine Trail and Wine Train paid for these high-class art works. They would prefer that their routes not remind users of the uglier parts of New Jersey. Indeed, Napa may soon have a public arts district of international distinction. The trick is how to view these works. You can ride Wine Train, bike or hike the Vine Trail, or park near the Register and walk in just a little bit. Initially, I was irked that murals as special as these were so off the beaten path — the backs of commercial buildings, for heaven's sake. Then I ran into Laina Brown, co-owner of St. Clair Brown Winery on Vallejo Street, behind the Register on the west side of the Vine Trail and the railroad tracks. We toured the murals together. The whole concept of a Rail Arts District (with her winery having a front-row seat) charms her. Her neighborhood is suddenly a whole lot less gritty. Yes, it takes effort to view the murals, Brown said. To see "Floating Napa," some people venture into an auto repair parking lot on Action Avenue. Others tromp along the west side of the tracks for better perspective. "But isn't that part of the cool thing?" said Brown. "It brings you out into the world. It's an outdoor art gallery." St. Clair Brown is planning to install a bench beside its winery garden so visitors can contemplate "Knocking on Heaven's Door" in a leisurely way. Plans are afoot for a west side mural that runs along the backside of St. Clair Brown sheds and the track-facing side of British Auto Repair, Brown said. This is all so unexpected, she said. So beyond what anyone was thinking a blink of an eye ago.